Stuart Moss joined the Rockville Brass Band in 2018. Stuart is originally from the county of Lancashire in the North of England. 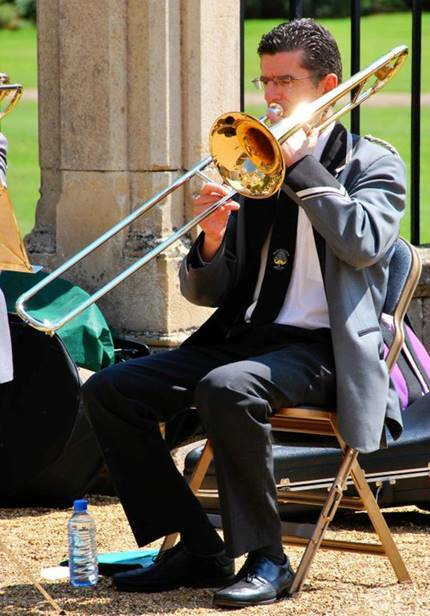 He started playing the trombone at the age of ten. It wasn’t long afterwards until he joined his first brass band, Pilling Jubilee, and a couple of years later transferred to Poulton-Le-Fylde band a few miles nearer to home. From the age of twenty, Stuart started working in communications engineering for the UK Government which prompted a move to the Midlands where he settled in the town of Northampton. 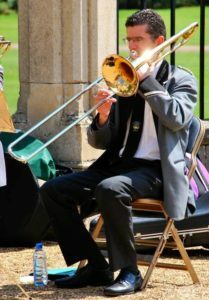 Whilst there he played for Moulton 77 brass band, Daventry Brass and Northampton Concert band. Stuart’s career has taken him overseas on several tours where he has played with many different groups (quartets, concert bands and orchestras). One particular highlight was playing for the Banda Sinfónica de la Facultad de Filosofía y Letras in Buenos Aires under Gustavo Fontana.